IF you were thinking of an ideal location on which to base a commercial fish farm, you wouldn’t necessarily think of the mountainous land-locked African nation of Lesotho(Lesotho Times; 2014) . Yet from small beginnings just two years ago, the country’s Highlands Trout operation has become a big fish in a rather small pond(Lesotho Times; 2014) . The company now proudly produces some of the world’s finest “Made in Africa” trout, and is exporting hundreds of tonnes of fish to Japan and South Africa(Lesotho Times; 2014) . In Japan, the firm has managed to bypass the large, wholesale fish markets, and its trout have become a favourite in gourmet sushi(Lesotho Times; 2014) . 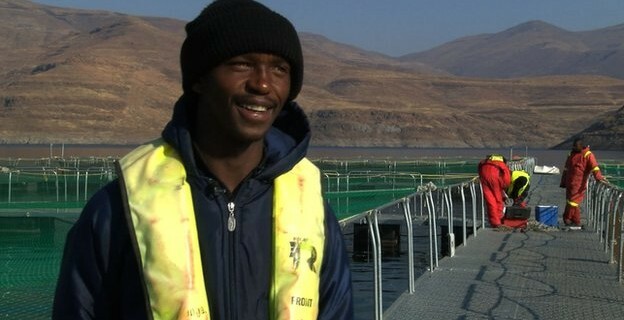 This has helped tiny Lesotho produce twice the amount of trout as its much larger neighbour, South Africa, and the operation has been heralded as an example of how Africa can benefit commercially from creative investment and utilisation of its aquaculture opportunities(Lesotho Times; 2014) . Nestled between the rolling Maluti mountains and just a stone’s throw from the Katse Dam, which is Africa’s second largest, is the headquarters of Highlands Trout(Lesotho Times; 2014) . It is an inspiring location, and the farm’s world-class facilities are outshone only by the stunning views of the dam that surrounds it(Lesotho Times; 2014) . Inside the high-tech building a nursery houses millions of trout eggs that have been imported specifically from Denmark(Lesotho Times; 2014) . The tiny hatchlings are later transferred into reservoirs situated in a climate-controlled room(Lesotho Times; 2014) . When the fish reach 20g, they are transported to grow-out cages on the Katse Dam itself(Lesotho Times; 2014) . Once there, they are fed on a high-protein pellet diet imported primarily from France(Lesotho Times; 2014) . When they reach about 2.8kg in weight, the fish are taken from their cages on the dam, and are processed for export(Lesotho Times; 2014) . With few natural resources and a weak economy there are few opportunities for formal employment in rural areas such as Katse(Lesotho Times; 2014) . Many locals are forced to seek work in Lesotho’s capital Maseru, or in South Africa’s mines, where low prices and labour unrest have led to tens of thousands of migrants losing their jobs(Lesotho Times; 2014). However, with 99 percent of its workers coming from the local area, Highlands Trout is investing in local employees through training and skill development(Lesotho Times; 2014) . Vincent Sitsane, who was born and raised near the dam, used to fish on Katse waters as a child, and was hired by contractors to help renovate what would become the fish farm’s headquarters(Lesotho Times; 2014) . Now, thanks to Highlands Trout, he is studying aquaculture at the University of Stellenbosch in South Africa, and has risen to become nursery supervisor. “I used to have to travel to other areas far away in order to get even casual jobs,” he says(Lesotho Times; 2014) . Christopher Lalane also began as a builder on the project – he is now the team’s cage supervisor(Lesotho Times; 2014) . “When I was growing up my father was working in South Africa and my mother was working in Maseru. 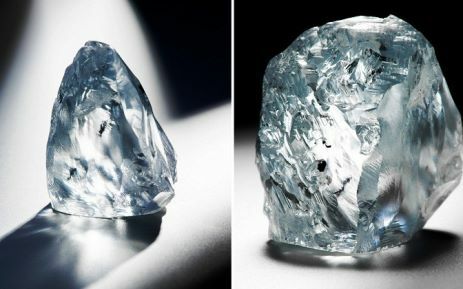 But this is good because it is close to work, so you can work and then just go home,” he says(Lesotho Times; 2014) . “What I want to see is this company going forward, so that no more people have to go to South Africa to get work(Lesotho Times; 2014) . Freshwater stream trout, like the ones harvested here, are usually found in the ice-cold regions of North America, Russia or Norway(Lesotho Times; 2014) . The idea of raising the fish in Lesotho started around 2005(Lesotho Times; 2014) . After many biological and environmental studies and a multi-million dollar investment from the South African gold producer, Gold Fields, in 2009, Highlands Trout received its fish farming licence three years ago(Lesotho Times; 2014) . Operations officially started in 2012, a year that saw the fledgling company export an impressive 500 tonnes of fish(Lesotho Times; 2014) . By the end of this year the company forecasts it will have exported over 1,500 tonnes of trout, and expects to be selling 4,000 tonnes by 2018(Lesotho Times; 2014) . Japan takes 80 percent of its produce, 15 percent goes to South Africa while the remaining five percent is sold locally(Lesotho Times; 2014) . 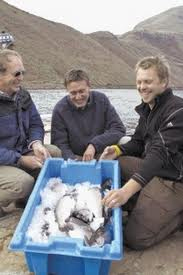 “Price is dependent on size and quality,” explains Highlands Trout managing director Grant Merrick, but says current global trout prices are over $5 (M54) a kilogram(Lesotho Times; 2014) . The trout are exported to Japan via the nearby South African port of Durban, from where refrigerated containers are used to ship the fish on their four-week long journey to Japan(Lesotho Times; 2014) . At a recent conference in Stavanger, Norway, Fred Formanek of the Advance Africa Management Services cited Highlands Trout as a prime example of how fish farming can become a thriving industry in Africa(Lesotho Times; 2014) . As for the future, Mr Merrick says the company plans to increase its production in Katse Dam and expand production to Mohale Dam, as well as adding to its product range with a filleted trout range(Lesotho Times; 2014) . Nthabeleng Ranchobe Makhetha, the company’s principal microbiologist, hopes Highlands Trout’s growth will help other local firms develop, which could then provide the equipment needed for production(Lesotho Times; 2014) . “Things like cages, we import them from Norway, so they take about six months to get here,” she says(Lesotho Times; 2014) . that you stand for as a company.